Looking for tips for designing your love nest? 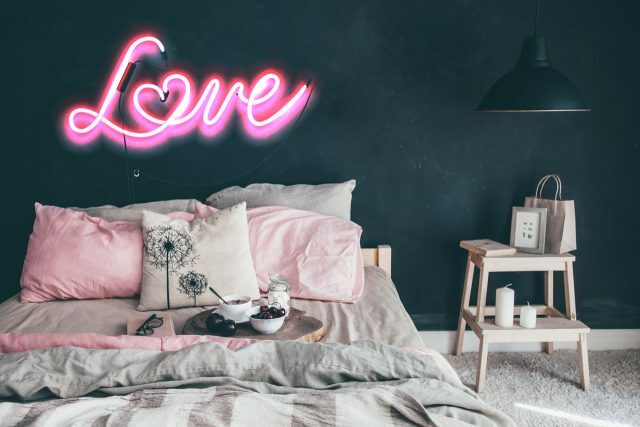 You better stop here, because we have some romantic bedroom decor ideas and some helpful tips. Romance is not reserved only for Valentine’s day. The ideal couple bedroom offers the proper atmosphere for sharing romantic moments with your beloved one every single day. 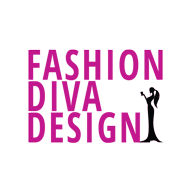 Romantic decor can stay with us for much longer to boost the romantic and intimate atmosphere. Things such as a beautiful flower mural can make a big change. Would you agree with this? Read on and find out more! If you are looking for one item that is cheap and will add a romantic vibe in the bedroom, then you really need string lights. These are not reserved for holidays only, as you can include them in your permanent decor. Think of the string lights as a smart way to incorporate romance. They will not overpower the room but will bring more subtle light. 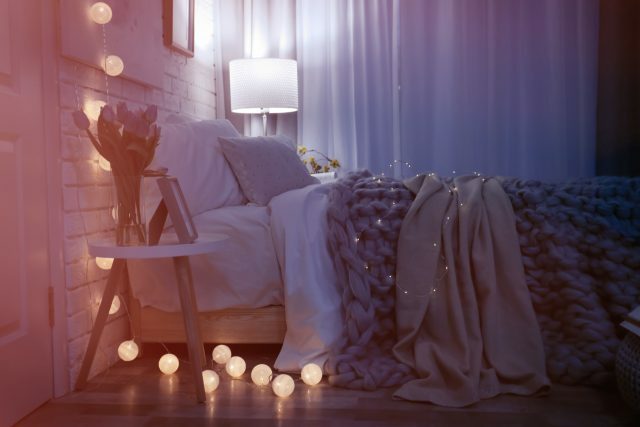 Lacking ideas on how to decorate your bedroom using string lights? Try to wrap them around a desk mirror. Or, you can decorate the sheer curtains for awesome effect. The possibilities are endless! Designers would agree that textures add dimension to a certain space. In the bedroom, you have to work towards creating a calming and romantic atmosphere. The trick is to mix different textures that are soft and gentle. This kind of details will work together in a fantastic way, so feel free to incorporate fluffy details via faux fur throw pillows or an area rug. This is a clear example of how to achieve the desired effect. The pink woven blanket, together with tufted details and the muted gray accent pillow, creates the perfect romantic bedroom. Do not forget to add matching glamorous wall decor for the finishing touch! Flowers are always considered to be romantic, so this means that you are free to incorporate them in the bedroom. Think of a floral mural as an excellent way to bring the romance in. Open your doors for an eye-catchy and fresh floral pattern that is meant to make a statement! Myloview has a wide range of beautiful romantic flower mural offers so that you can pick the best one for your room. 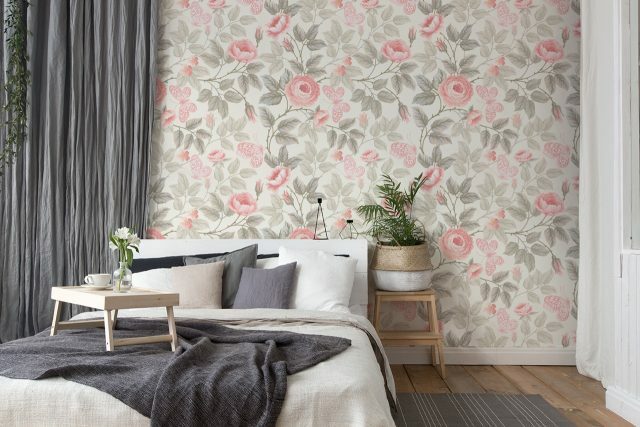 These floral murals are a lovely way to bring romance in the bedroom. When picking the right pattern, the only thing that you should have in mind is the color scheme of the room. Pick three colors that dominate in your bedroom and purchase a mural that has them. This tip will help you choose a cohesive mural that will fit perfectly in the bedroom. 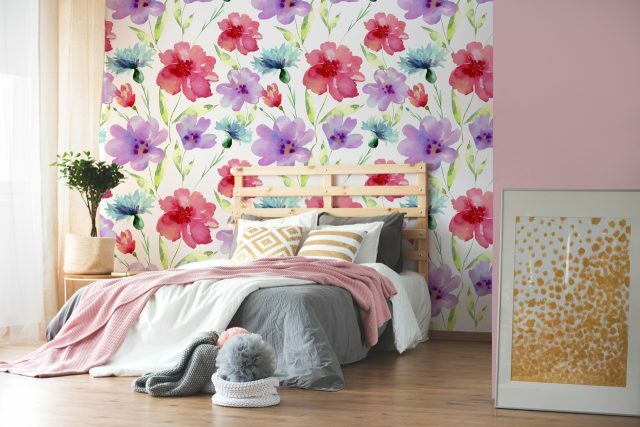 Not only the large flower mural can help you create an accent wall in the bedroom. Neon signs are meant to make a statement, so why not give them a go? 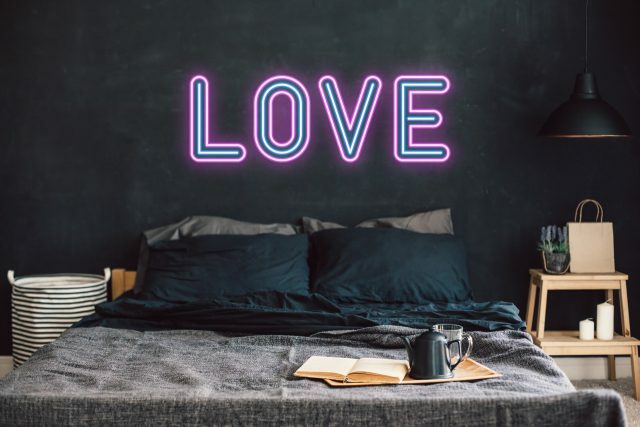 A cute neon sign spelling “Love” is an excellent way to bring fun in the bedroom. The good thing about neon signs is that they illuminate the room in such a wonderful way.